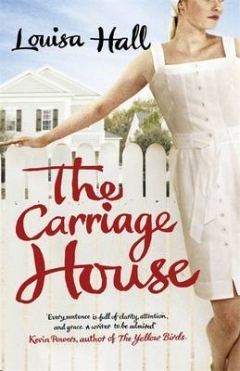 The Carriage House opening line: From the time that his daughters could lift their rackets, William had loved nothing more than to watch them play tennis. The book is about the Adair family and two would be lovers. William who asked Adelia to marry him ends up marrying Margeaux and they have three children. Adelia never grows up and at 50 holds on to the same childhood hopes echoed by Isabelle, the youngest of William’s 3 children. Just like Adelia Diana turns down a proposal and then lives her life in limbo waiting for Arthur to ask again. Elizabeth is the adult, a divorced mother of 2 whose children hold out the only possibility of William see his dream of success on a tennis court live on. I read this book in a matter of days. It is light reading and very well written. As a first novel I can add Louisa Hall onto my list of writers to look out for. This sounds something interesting and lovely. I would definitely go for it. Thanks for sharing about this novel as I love reading lovels and looking for a new content. Nice review Tandy. Linkedin has a nice book review feature also if you are interested.